The XP-55 Ascender is a premium rank II American fighter with a battle rating of 3.7 (AB/RB) and 3.0 (SB). It was introduced in Update 1.31 and costs 3,900 GE. 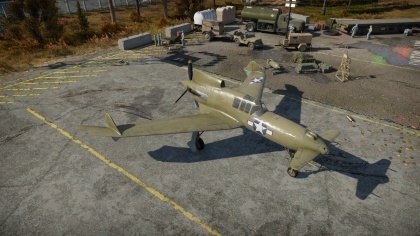 The XP-55 Ascender is unlike anything you will fly in the U.S. Tech Tree. Flying this aircraft effectively requires a dedication to Energy Fighting. 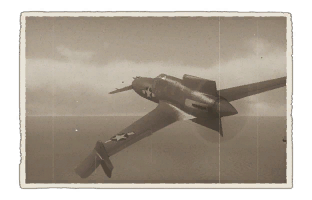 The XP-55 excels greatly in the ability to climb and dive and this is your greatest advantage. The Ascender has decent maneuverability and best used in a Boom & Zoom function. All four of this aircraft's armament are packed tightly in the nose for devastating results. The U.S. Army sponsored three prototypes for a new pusher power-plant propelled fighter in 1941. Out of this was born the Vultee XP-54, Northrop XP-56 Black Bullet, and the Curtiss-Wright XP-55 Ascender. Four airframes were built for testing the Ascender. The first aircraft was delivered on July 13, 1943. During its testing they discovered it required a long take off run for the nose-mounted elevator to become effective. Before the issue could be addressed the aircraft was lost on November 15th. The second and third XP-55 flew in the spring of 1944. The second aircraft was used a test bed for armament. On May 27, 1945 the third XP-55 took flight for public display over a crowd of 100,000 people. When the XP-55 crossed the airfield the pilot began to roll the aircraft. With out warning, the aircraft dove straight into the ground while being inverted. The pilot was thrown from the wreckage and suffered severe injuries. A nearby bystander was killed. After testing, the Acender was judged to have poor performance and handling. The design was ultimately deemed to ineffective for a fighter. Although XP-55 program was plagued with issues, it made numerous contributions to aircraft design. The second XP-55 is still on display today at the Smithsonian Institute's National Air and Space Museum in Washington D.C.